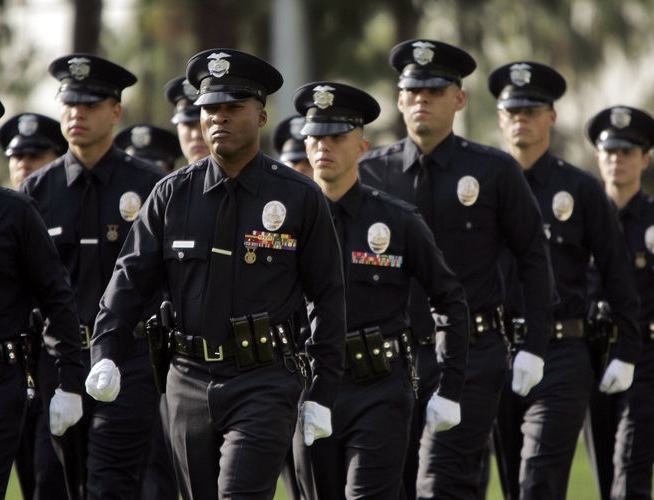 A labor movement that seeks to fight oppression has no room for police unions. Last weekend, UAW Local 2865 became the first local to call for the expulsion of a police union from the AFL-CIO, insisting in a resolution that the federation kick out the International Union of Police Associations (IUPA). It was a laudable move that evinced a commitment to social movement unionism — other locals should follow suit. The UAW local, which is comprised of 13,000 teaching assistants and other student workers on University of California campuses, specifically decried cop unions’ lobbying against oversight, support for politicians opposed to police accountability, and dogged defense of officers accused of abuse. So what business do academic workers have passing resolutions against police officers? The better question, amid an upsurge against lethal policing, is how unions should relate to popular movements that it hasn’t directly birthed. Social movement unionism recognizes that labor isn’t a sectional interest, and it shouldn’t behave like one. It should instead place itself at the center of struggles that improve the lives of workers and take on social injustice. The proper constituency of a union isn’t simply its membership, but the entire working class. As their record since the emergence of the Black Lives Matter movement demonstrates, police unions aren’t institutionally equipped to be anything other than anathema to this cause. Police unions outside of New York City have also behaved deplorably over the past year. The police union representing Ferguson cops raised money online for Darren Wilson, Michael Brown’s killer. Baltimore’s did the same for the officers charged in connection with Freddie Gray’s death. And the Cleveland Police Patrolmen’s Union raffled off a Glock as a fundraiser for the cop accused of killing twelve-year-old Tamir Rice. When confronted with information of police unions’ misdeeds, many progressives accuse the bearer of anti-union animus. But if the Black Lives Matter movement has taught us anything, it’s that cops are different from other public-sector employees. Hoping for reform-minded police unions is also delusional. The GI movement encouraged rebellion within the ranks to terminate the Vietnam War; police unions, by contrast, have repeatedly fought to retain and expand the state’s coercive apparatus. The few reform organizations that do exist — such as the National Black Police Association — have failed miserably. If anything, reform groups would benefit from being able to organize without the influence of an overarching union. The same goes for individual officers. Unencumbered by the union apparatus, it would likely be easier to convince those of good conscience to betray their occupation’s prerogatives and fight for radical causes, including the transformation of policing. Others may concede we shouldn’t equate cops and teachers and that reform is unlikely to come from the men in blue themselves, but still think it wise to house police unions under labor’s tent — the better to moderate their most reactionary impulses. And to be sure, the largest and arguably most egregious police union — the Fraternal Order of Police, which boasts more than 325,000 members — isn’t affiliated with the AFL-CIO. But corralling them into the labor federation would lend them a legitimacy that they both don’t deserve and would be injurious to social movement unionism. Termites of the labor movement, more influence for police unions would threaten the very foundation of progressive unionism. The most spick-and-span cop union still takes as its mission the advancement of police and policing as an institution. Trumka’s intent, of course, was to telegraph empathy and signal the AFL-CIO’s commitment to racial justice, and the speech did contain plenty of commendable denunciations of racism and police brutality. But the moment underscored the problem with inviting agents of oppression into a movement founded on fighting it. Wilson, though not represented by a union affiliated with the AFL-CIO, was still counted as an upstanding union member. As the UC academic workers recognize, there needs to be a clearer line of delineation. A labor movement that values the Michael Browns and Freddie Grays and Sandra Blands has no room for police unions.